What, How, and Why do you write? The National Council of Teachers of English, The National Writing Project, The New York Times Learning Network, and the Teaching Channel want to know. Today, Tuesday, October 20th, 2015, people everywhere are encouraged to respond to the prompt asking What, How, and Why do you write as part of the Seventh Annual National Day on Writing. Reponses to will be shared in in a “tweet up” during the day using the hashtag #whyIwrite. I have, of course, my own reasons why I write, but first I would like to share two statements made by the senior media correspondent for CNN, Brian Stelter at a Q & A session at the Inspire Expert Event at the NY offices at About.com (10/17,15). This event brought together the experts that write for the About.com website. Brian Stetler has been a media reporter for The New York Times and the editor of TVNewser He currently hosts the CNN Sunday morning show Reliable Sources. In this Q & A session Stelter’s two statements on writing stood out, not because they were surprising, but because they were not surprising, especially for any of the other writers in the audience. This first statement speaks the importance of writing as a process for learning. Because I am an educator, I am expected to promote writing everyday at every grade level and in every subject. Because I write, however, I can attest to how much more I learn about a topic when I write about that topic. Practicing writing is no different than practicing math facts or practicing for an athletic competition. Writing more improves writing. This statement by Stelter supports writing as a process of discovery, of finding out what one thinks, of enthusiastically embracing new ideas, of living with the creative disruption of ideas. When I taught the Advanced Placement English Literature class, the timed in class essays that students drafted would often begin with one idea (thesis) in the opening paragraphs that would mature and change midway through the essay. Somewhere in the middle of this rough drafted essay would be this creative disruption-a new idea- like the discovery that Stelter claimed he found in writing. In these drafts, each student wrote his or her way into the new idea and (usually) developed a more confident position as he or she wrote. Such an essay would conclude making a point different from the original thesis, a surprise to students who discovered a common experience- “I didn’t know what to write until I wrote it.” While this in class writing exercise from my students produced a series of poor to average drafts that needed revision, there was evidence of great thinking on these papers. That is what writing is. Writing is thinking on paper. 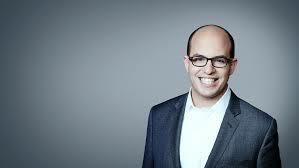 Brian Stelter explained that thinking. Writers understand that thinking. So What do I write? I write about education. Why do I write? I write to know what I think. Happy National Day of Writing!